MLB World Series champions the Houston Astros came unstuck against James Paxton and the Seattle Mariners in an 8-6 defeat. 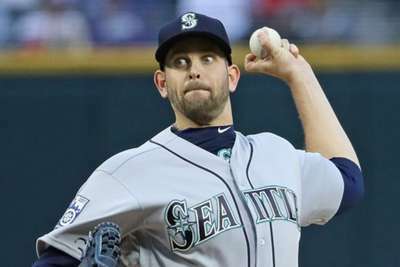 Paxton wreaked havoc against the Astros on Thursday – Houston falling 0-4 against the Mariners pitcher. Seattle have a 4-6 record against the Astros this season. All four of those wins have come with Paxton on the mound. While Paxton did not have his best outing as he allowed four earned runs in 5.6 innings, he still did what no other Mariners pitcher has done this season — he beat the Astros. This is not new either. Since the start of the 2017 season, Paxton is 6-1 against the Astros with a 1.88 ERA. With the win the Mariners moved to within seven games of the Astros in the American League West and two-and-a-half games of the second wildcard spot. Even in a loss, Mookie Betts can do no wrong. The Boston Red Sox fell to the Toronto Blue Jays 8-5 but Betts hit for the cycle, went four for four and took a walk as well. Betts is now hitting .347 with 27 home runs and 59 RBIs. Washington Nationals starter Gio Gonzalez threw seven innings of one-run ball to inspire a 6-3 win and a split of a four-game series with the Atlanta Braves. Milwaukee Brewers closer Corey Knebel gave up four runs and got zero outs and a loss in an 8-4 defeat to the San Diego Padres. He loaded the bases with no outs and was removed for Joakim Soria, who gave up a grand slam to Hunter Renfroe which ultimately proved to be the difference in the game. Stop us if you have heard this before: Nolan Arenado made a diving stop and a beautiful throw to steal a hit. Brian Dozier was his victim this time. The Oakland Athletics moved within four-and-a-half games of first place in the AL West thanks to Paxton and the Mariners and they could inch even closer on Friday as they take on Felix Pena (1-3, 4.97 ERA), who will be making just his ninth career start for the Los Angeles Angels. Brett Anderson (2-3, 4.64) will take the hill for the A's.